Preheat the oven to 450 degrees F. Combine the potato slices, artichokes, olives, rosemary, 2 tablespoons olive oil, 1 teaspoon salt and a few grinds of pepper in a large bowl. Spread the mixture evenly on a parchment-lined baking sheet; bake until the vegetables are tender and lightly browned, about 20 minutes. Brush the fish with 1 tablespoon olive oil and season with 1 teaspoon salt and a few grinds of pepper. Remove the baking sheet from the oven and set the fish on top of the vegetables. Return to the oven and continue baking until the fish is opaque and the vegetables are golden brown, about 10 minutes. 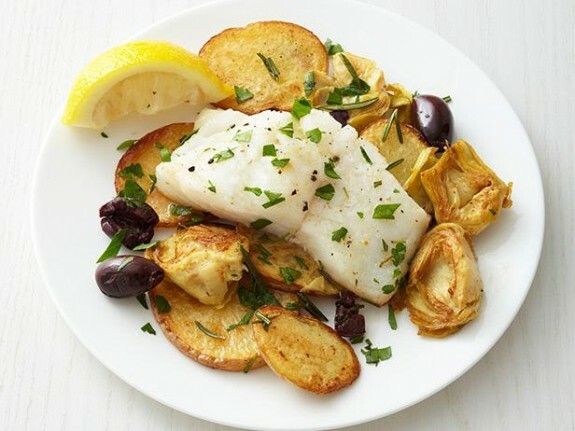 Drizzle the fish with the lemon juice and the remaining 1 tablespoon olive oil. Sprinkle with the parsley and serve with lemon wedges.